Cavatelli is a curved, short pasta resembling a hot dog bun with a long rolled edge which helps it to hold thicker sauces. 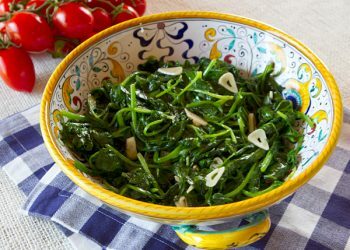 A product of Sicily and southern Italy, these noodles are traditionally made by hand, although they are also commonly found frozen in North American Italian specialty stores. 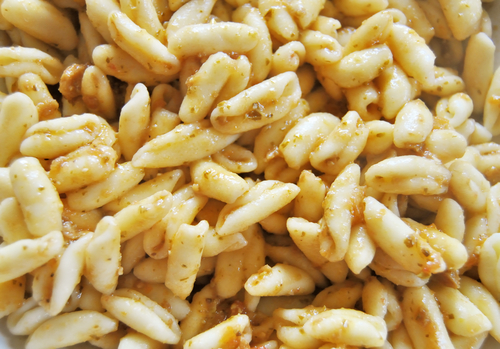 Traditionally, cavatelli is made by hand using a semolina flour dough. 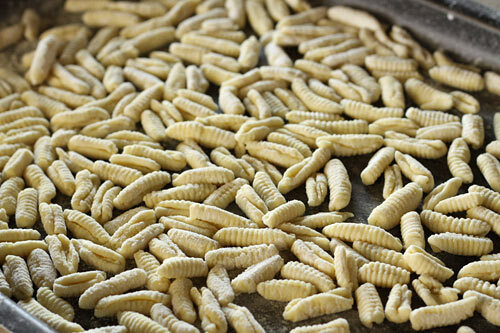 In North America, it is possible to find dried cavatelli shaped pasta made with semolina, as well as a softer form (often sold frozen) made from either a ricotta or potato based dough. 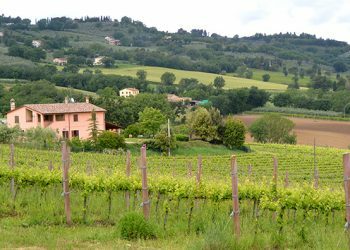 Although cavatelli is sometimes confused with gnocchi, generally gnocchi dough is much softer than one used to make cavatelli. Although I have made cavatelli by hand in the past, I came across this great little cavatelli maker for around $20 US on Amazon.com and ordered it. I have used this machine a handful of times already with great success so I decided to share my experience with you in step by step photo instructions. This recipe is one using ricotta cheese for the dough, and it creates very tender, delicious little bites of pasta. I have experimented using both tipo “00” (cake flour), and tipo “0” flour and find a combination of both works best. Unlike gnocchi dough which I try to work as little as possible, this dough requires a bit of kneading to obtain the best texture and firmness to hold together as it passes through the rollers and cutters. Through experience, I have found that the trick to making cavatelli with this machine is to keep the dough strips a similar width, and to keep the strips well floured when passing them through the rollers to prevent sticking. Once the cavatelli drop out of the cutter, I toss them in a little more flour and place them on a baking sheet. 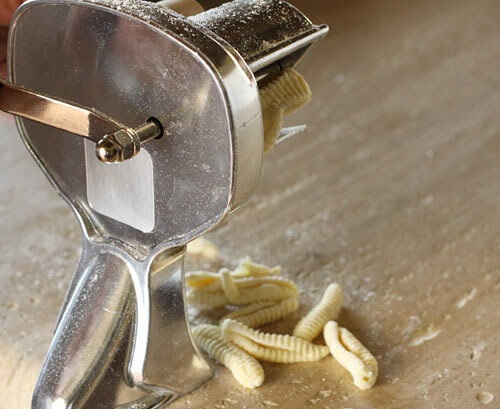 To clean the cavatelli machine, treat it as you would any pasta machine, using just a cloth or brush to remove ant bits of dough or flour sticking to it. Never immerse your cavatelli maker in water. 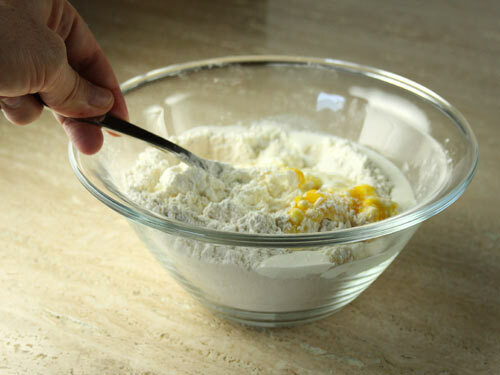 Place your flour in a bowl and make a well in the center. Add your other ingredients into the well and stir until the dough comes together. 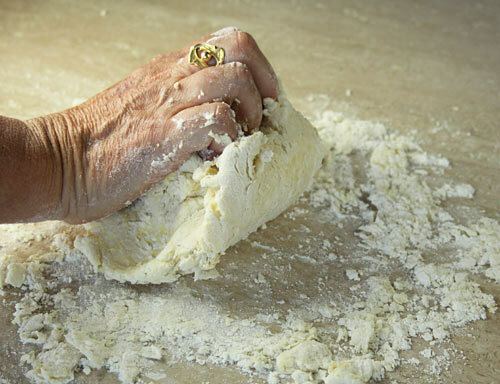 Dump the dough onto a floured surface and knead with your hands for 2 to 3 minutes until smooth. Cover with plastic wrap or a damp towel and let the dough rest for 15 minutes. 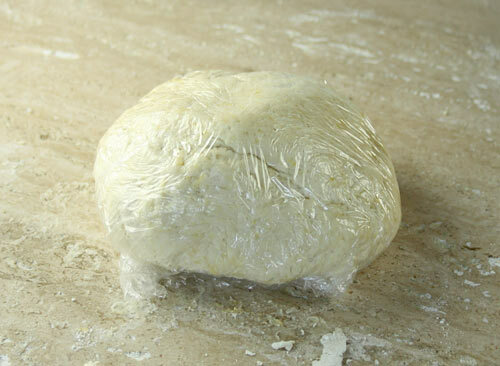 You may also wrap the dough in plastic and refrigerate it until needed. This rest period is necessary to obtain the right texture of the dough. 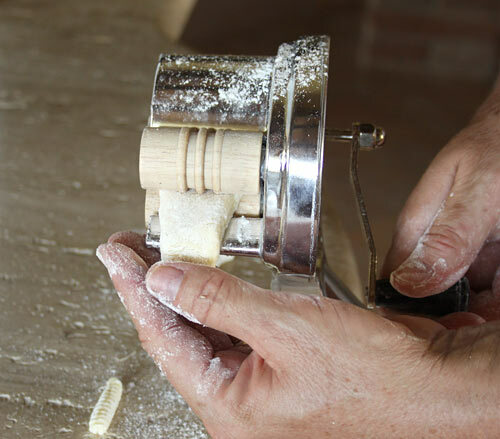 When ready to cut the cavatelli, first cut the dough in half and place one half on a lightly floured surface. 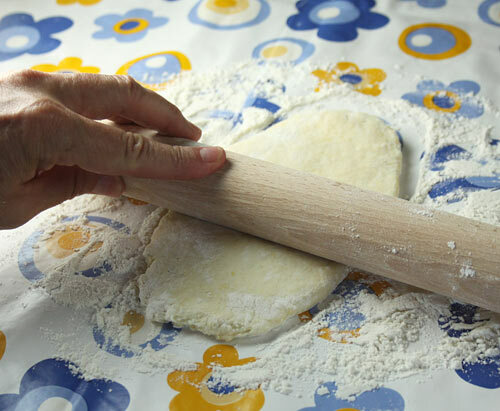 Roll the dough to a thickness of about 1/3 of an inch thick and cut into strips about 1/2 to 3/4 of an inch thick. Flour a strip well, and using one hand, pass it through the wooden rollers, turning the crank clockwise with the other hand. The cavatelli will drop onto the counter after they are cut. 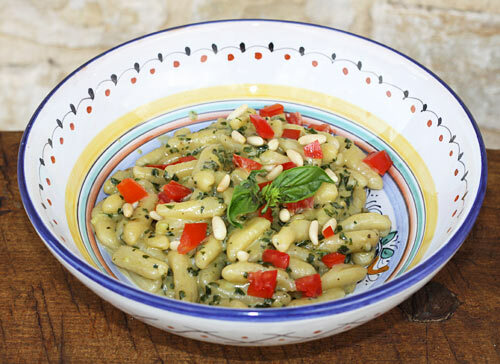 Place the cavatelli on a lightly floured baking sheet and refrigerate until ready to cook. Cook cavatelli in large pot of boiling salted water for about 5 minutes. Like gnocchi, cavatelli will rise to the surface when cooked. Drain and top with your sauce of choice. 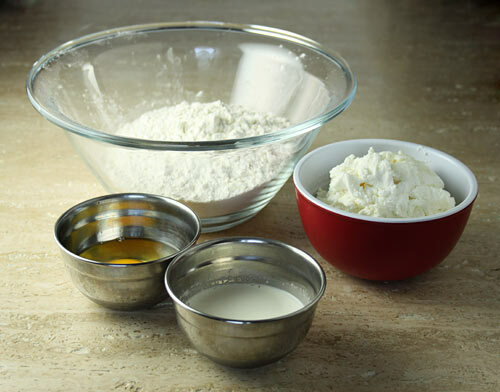 Measure and assemble your ingredients – Flour, ricotta cheese, salt, cream and egg. Make a well in the flour and add the other ingredients into it. Begin to mix until the dough comes together. Dump the dough onto a lightly floured counter, and knead for 2 to 3 minutes with your hands until you get a smooth dough. Wrap the dough in plastic wrap or a damp towel and let rest 15 minutes on the counter or for a few hours in the refrigerator. 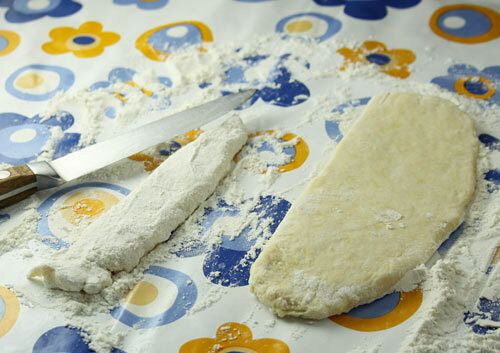 Cut the dough into workable pieces and roll on a floured surface until your dough is about 1/3 of an inch thick. Use a sharp knife and cut the dough into 1/2 to 3/4 of an inch thick strips. Flour the strips well before using to prevent sticking. Use one hand to feed the strip between the wooden rollers while using the other hand to turn the crank clockwise. Another look at the dough strip being fed into the machine. 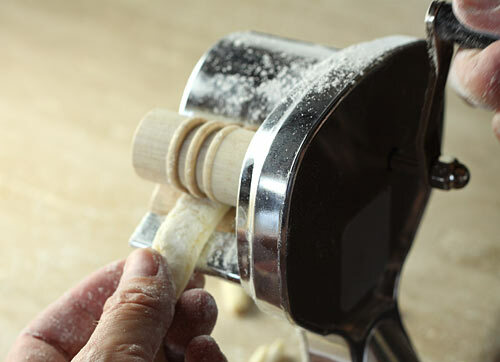 As the dough passes through the rollers it is then cut into cavatelli which fall out onto the surface below. Place the completed cavatelli onto a lightly floured tray and cook immediately or store in the refrigerator until needed. 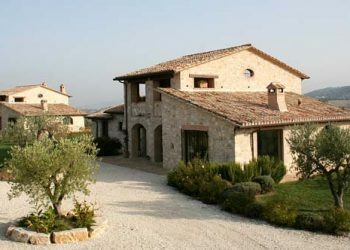 Where would I find a cavatelli maker? I love this! 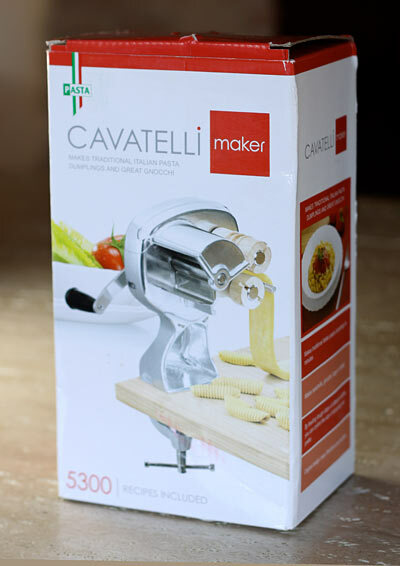 Amazon.com has a few different models of cavatelli makers. Can I make these with a semolina/flour dough or is this the best dough recipe for these results? I have a maker similar to yours and find that when I put the dough in as a rope I get a thicker pasta and it works in the machine better. I’m not sure why that is. I’ve not tried this pasta dough (with ricotta) using semolina flour. I find that as long as the dough is well floured, it does not stick to the machine. I have made a very similar recipe & used 2/3 semolina & 1/3 flour.. I hand roll & cut..
Marie, cavatelli are a little difficult to make by hand but I am sure if you look online you can find directions. I have the same cavatelli maker and I love it. So much faster and easier. Doesn’t work for me with gnocchi though, the dough is too soft. I’ve been making these for over 40 years. I use a food scale and measure ingredients by weight…1 and1/4lb flour, 1lb ricotta and one egg. I mix the egg in the ricotta and then add this to the flour. Working it into dough…you should end up with clean hands and a clean bowl…that’s how I know its mixed well. I put the dough ball into a ziploc bag and into the refer for 30 min or so to settle. I cut the ball into quarters and work one at a time…flatten, roll out and I use pie tins to catch them in. The chilled dough goes through the machine with out putting too much flour on the strip. Experiment with the sizing. wide strip gives a longer cavatelli I make mine about a 1/2 inch. 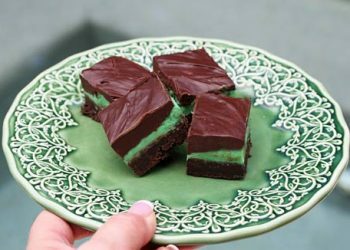 Be sure the strips are thin enough to pass easily through the machine, too thick and the dough squishes out by the wood rollers! When we have a dinner party I wait till the guests arrive and roll them out as part of the entertainment! I was taught to make them by hand, didn’t realize that they have a machine for that…wow, where have I been??? 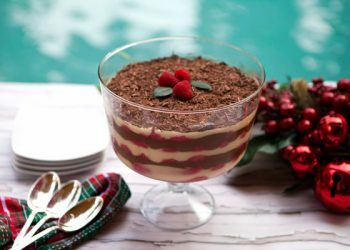 My mom’s recipe is similar to yours except there is no cream involved. I will have to try using a combo of semolina and regular flour to see how that turns out. I have that machine and it produces lots of “slugs”. It’s not machined very well. So lately I’ve been doing them by hand on my gnocchi board. I cut a narrow rope into very small pieces and then in the palm of my hand roll into “torpedoes”. Then I use a butter knife to roll and curl them down the board which I’ve dusted with semolina. For the dough I use Tipo 00 and brown rice flour, my home made ricotta and one of our backyard chicken’s eggs., and a touch o salt. Oh, I appreciate your information, I did learn lots!